In 1902 a final batch of 10 special cattle wagons were built by the L&NWR at Earlestown. 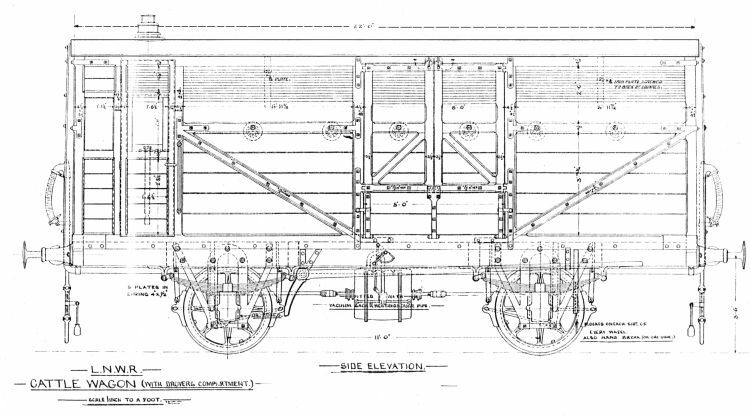 Like those to Diagram 25 they incorporated a drover's compartment, but in comparison the overall length was increased to 22 feet with the cattle section lengthened to 17ft 9in. A surviving official general arrangement drawing, Earlestown GA 64, [HMRS 1158] dated 23.10.01 is reproduced below. This records the details of the mechanical specification. Note that full vacuum clasp brakes were fitted with a cast iron block on each side of each wheel. The hand brake operated one of these blocks on one wheel on one side only. A Westinghouse through-pipe was also fitted to allow for working on the Caledonian railway. An official photograph, below, shows one of these special wagons in 1909. The numbers they carried fall into two separate batches. Firstly, 67403-67406 inclusive which, follow directly on to the numbers assigned to the six Diagram 25 special cattle wagons that were built 3 years earlier in 1899. It is intriguing to note that the next numbers, 67407 to 67409, were carried by 3 Diagram 43 Gunpowder vans, also built in 1899. Since there is no evidence that these four Diagram 26 cattle wagons were built until 1902, we must conclude that this batch of numbers was reserved against future construction. It is possible that all ten were ordered in 1899 as D25's, but that the change to the Diagram 26 design was agreed before the last four were started. Consequently, the designated numbers were held in abeyance until building of the new design commenced in 1902. A further six were built concurrently and allocated No's. 72329 to 72334 inclusive, which are numbers known to have been issued for the first time in 1902. Six additional vehicles were built later as follows. No.49626 was built in March 1912 as a replacement for a former Diagram 23 wagon, probably damaged beyond repair in an accident, and in the same year No. 49477 ex-Diagram 24, Fowler's Cattle Wagon, built 1884, was renewed as a D26 wagon. Later, in 1921, the other ex-Fowler's Cattle Wagon, No.49476 was condemned and it too renewed as a D26 wagon. Additionally, there is evidence [RAIL 410/1451] that three more ex-D23's were renewed as D26's in 1923. Consequently, sixteen D26's passed into the LMS goods stock. 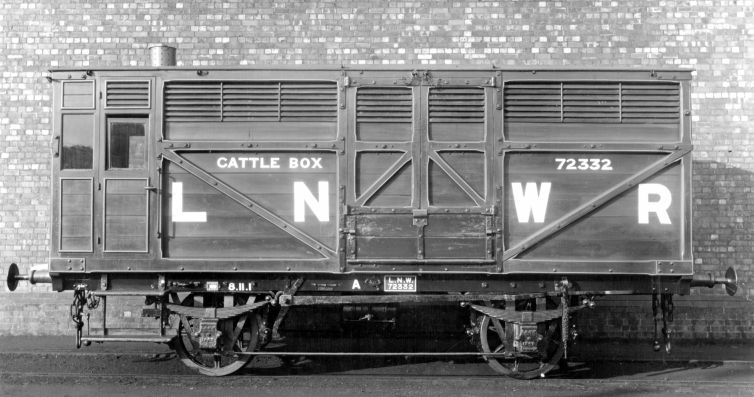 Ten ex LNW cattle wagons were listed in the LMS 1933 renumbering scheme. See table below. 43962 272329 D26 22ft compt. Still as built in 1902. Withdrawn 2/43. 43963 272332 D26 22ft compt. Still as built in 1902. Withdrawn 7/43. I am indebted to Philip Millard for the renumbering and withdrawal data in the above table. Notice that there are photographs of three of them, numbered, M43964, M43966 and M43968, in BR days.